And here are the Jaals. Erel’maeyl really made it hard to choose which gender pronoun to use. His or her desire to be mysterious about his or her gender extends to those outside the story. I had to ask Jaibyrd for the correct gender pronouns to use. Jaibyrd also said xe is tainted. Erel wears an orange and black top, red pants and black boots with high heels. Xis hair happens to be thick and bushy. Erel likes confusing people with the fact xe is a hermaphrodite. Xe also adores Snadhya’rune for her brain. Erel and xis companions were on their way to Felde when the Vloz'ress summon drew their curiosity enough for them to get closer. When they were close enough, Erel was the one who first greeted the people on the summon. Xe explains that xis reason for going to Felde is because the gathering is going to decide the future of Chel. They lead the group on the summon to Felde after it turns out they were going in the wrong direction. Erel, Visapa, Vual'raisa and Fia'nova were together as Snad makes her speech. When Shodun gave the command, xe kneeled. "''A gathering will take place to decide the course of Chel’s future.''" Visapa has freckles on her face and she barely covers her cleavage with some brown cloth. The mask she wears is made to look like a wasp. She is obsessed with insects. Visapa and her companions were on their way to Felde when the Vloz'ress summon drew their curiosity enough for them to get closer. After the introductions, she explains that she's going to Felde because she doesn't want to miss out on the opportunities the Felde gathering can provide. They lead the group on the summon to Felde after it turns out they were going in the wrong direction. Erel, Visapa, Vual'raisa and Fia'nova were together as Snad makes her speech. When Shodun gave the command, she kneeled. "''To decline is to abandon your right to power. Only the foolish and the weak would remain in Chel.''" 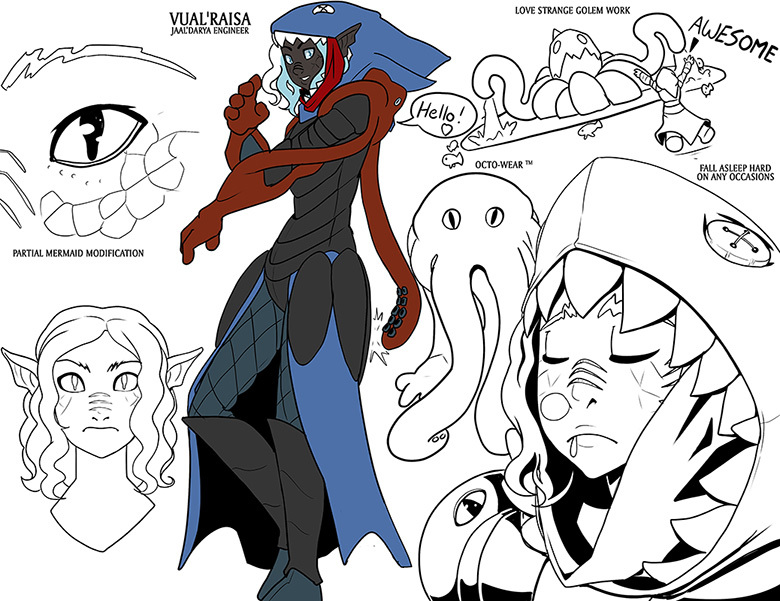 Vual’raisa wears an assortment of marine life-themed clothing, including a shark hood and octopus gloves. She loves strange and unusual golem work. Vual'raisa and her companions were on their way to Felde when the Vloz'ress summon drew their curiosity enough for them to get closer. After the introductions, she explains that she's going to Felde for knowledge and to see the manatech in Felde. They lead the group on the summon to Felde after it turns out they were going in the wrong direction. "''Knowledge! The best in manatech will be there.''" 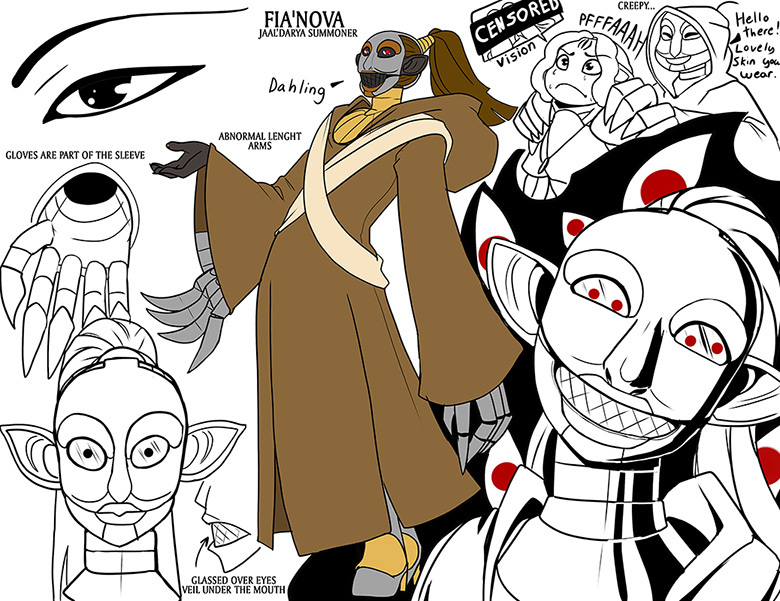 Fia’nova wears a brown robe and her brown hair is tied into a ponytail. She also has unusually long arms. She also wears large gloves that are part of the sleeves of her robe. The mask she wears has glasses over the eyes and a veil under the mouth. Fia'nova and her companions were on their way to Felde when the Vloz'ress summon drew their curiosity enough for them to get closer. She liked the turtle, which caused Kiel to like her. She explains that she's going to Felde to meet Snad, whom she considers to be a majestic ruler. They lead the group on the summon to Felde after it turns out they were going in the wrong direction. "''To meet the majestic ruler.''" Noted, and sorry about the apostrophe thing. I did this stuff on google drive and it's not consistent in punctuation, for some of them at least.